The battery in the Summer Infant handheld baby video monitor can overheat and rupture, posing a burn hazard to consumers. About 800,000 rechargeable batteries used in the Summer Infant video monitors are being recalled because of burn hazards, according to the U.S. government. The battery in the handheld baby video monitor can overheat and rupture, posing a burn hazard to consumers, the U.S. Consumer Products Safety Commission said Wednesday. 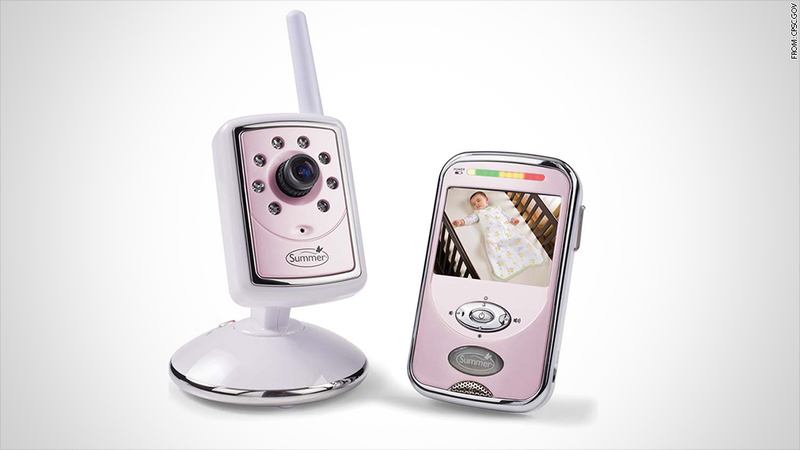 The federal agency said the recall applies to more than a dozen video models made by Summer Infant, including the Baby Touch, Safe Light, and Slim & Secure monitors. The batteries are about 1 1/2 inches tall by 2 1/4 inches wide and are marked "TCL" on the lower right corner. The company has received 22 reports of overheated and ruptured batteries, including incidents of smoke and minor property damage. About 58,000 of the batteries have already been recalled in 2011 for a similar burn hazard. The government said consumers should remove the battery and contact Summer Infant for a replacement battery. The monitor can continue to be used with the power cord. The units were sold between 2010 through 2012 and cost between $150 to $350. Summer Infant products are sold at Wal-Mart (WMT), Target (TGT), Babies "R" Us and Amazon (AMZN).